I recently dined at a fancy restaurant in town and was served a very simple zucchini side salad with green olives and a little garlic, it was so delicious and I was amazed at how tasty this shaved zucchini tasted, I recreated this recently when I had family visiting and it was a real crowd pleaser! The zucchini is shaved into long thin strips using a potato peeler and placed in a bowl with some lemon juice garlic ( 1/2 Clove finely chopped) and olive oil. I used 4 zucchinis because there were a few of us eating that night. 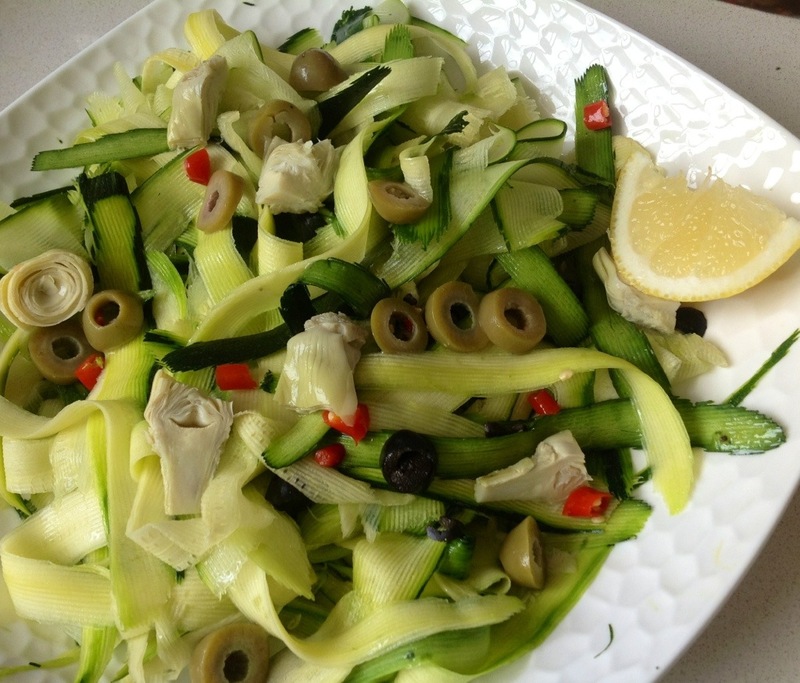 Although the zucchini is raw once the olive oil and lemon juice is added it begins to cook a little in the acid of the lemon and of course because zucchini does not have a strong flavour it takes on the lemony garlicky flavour and is a beautiful base for this salad. I then tossed in some sliced green olives.. I feel green olives are best in this dish because the compliment the flavour but don’t overpower like black olives can, the green also adds a lovely dimension to the green colours in this dish. Next I threw I some mint, steamed asparagus and blanched broccoli not a lot just a couple of small sliced florets. You don’t want them to take over the dish just add some deep green and some crunch and change up the flavours a little. It’s great if the greens are still warm when you throw them in as it makes the salad warm and the oils seems to coat a little better. Toss all these ingredients around so the lemon and olive oil and garlic coat all the ingredients. This is the basic recipe and is delish as is however as per the images above and below you can add throw so e additional flavours in there too! Season with salt and then throw in some croutons and feta cheese just to add some extra crunch and bite to the dish ( optional of course). The above picture features sliced artichokes and chilli as an alternative … It’s up to you what you want to add to this salad otherwise keep it basic! 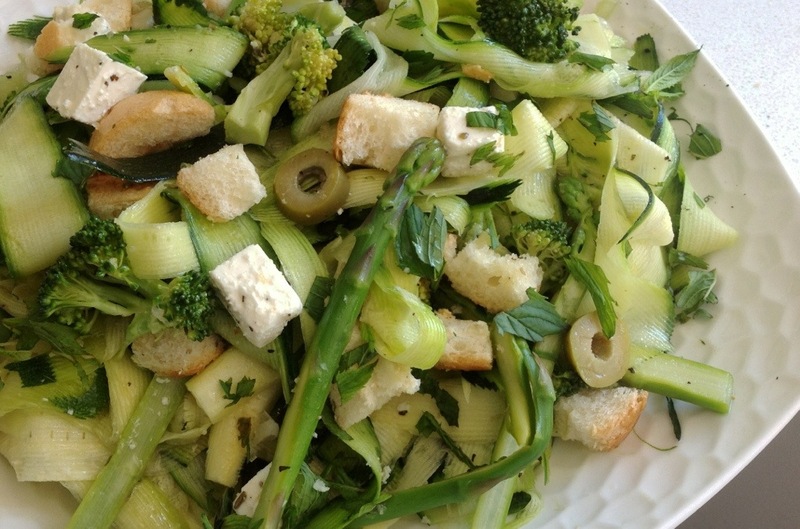 This is a deliciously different salad and a great dish to serve with pasta, fish, or pizza.. I have been known to just throw some of is salad on top of my pasta too! It’s also a great alternative to leafy salads in wintertime!! Summer Salads: Nectarine, Chicken and Nectarine salad with a mint dressing.